1. Puri: Mix rawa,soda,salt,maida with ice water and knead the dough to siighty elastic consistency. Apply oil and cover and keep aside for 20 min. 2. Make a big round shape with the rolling pin and press round shaped small lid or bottle cap & make more puri shapes.Around 45 puris u can make. 3. Deep fry the puris to fluffy,light brown & crispy.Remove them and drain them on the tissue paper.Don't keep puris one above the other.spread them.After it cools down,store it in air tight container. 4. In a pan mash the potatoes and add salt.it.Mix them. 5. 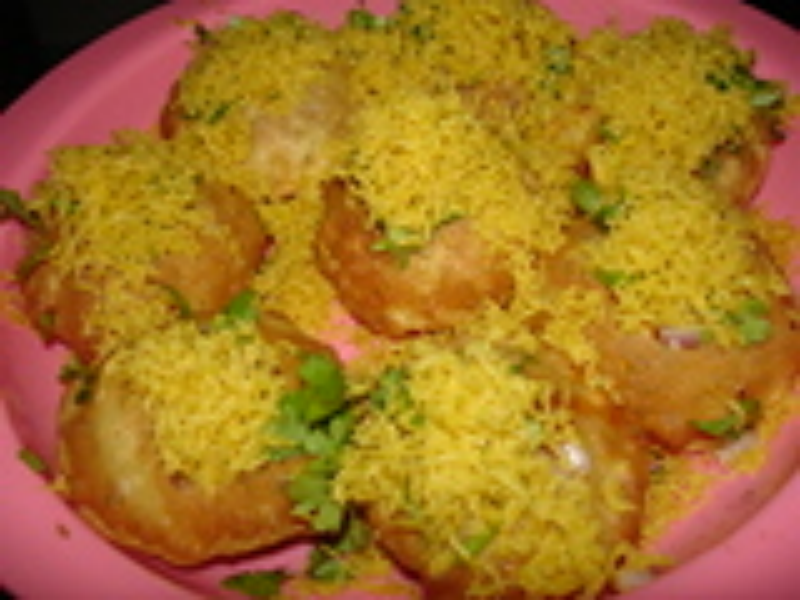 Take 6 puris in a plate.Make a hole in the centre and add a tsp of mashed or diced potato,sprinkle red chilli powder, jeera powder, chaat masala, a pinch kala namak, chopped onion, anardhana powder, green chutney, sweet and sour chutney, fine sev and coriander leaves. Note: Katta mita chutney: Soak lemon sized tamarind,10 dates & 2 red chillis in hot water.Grind them by adding ½ cup water and to a smooth paste.11/2 cups water can be added after grinding and sieve them and Add 1/4 cup jaggery,1/2 tsp dry ginger powder,1/2 tsp jeera powder and boil them till it thickens. (not too thin or thick).1/2 tsp.kala namak can be added to the sweet chutney.u can store the chutney in air tight container in the fridge.Jaggery depends on the sweetness of the dates.can be stored in airtight container in the fridge. Green Chutney:1/2 cup mint leaves,1/2 cup coriander leaves,1/2 inch ginger,2 green chilli,grind them to a smooth paste by adding little water.Add salt and ½ tsp lime juice.Chutneys can be stored in airtight container in the fridge. mint quantity shd be more than coriander leaves.please apologize. Thanks Rajeswari, One of my fav Indian snacks.They make my mouth always water.